Being a water-based mould release agent, our Perma Strike is deemed suitable for releasing concrete cleanly from foam work of material âï¿½ï¿½ metal, timber, plywood, or any other construction material. The chemical is constituted of special release ingredients in aqueous form. Such composition makes the chemical ecological and affordable. We are emerging as the leading Manufacturer, Exporter, and Supplier of Perma Strike from Mumbai, India. 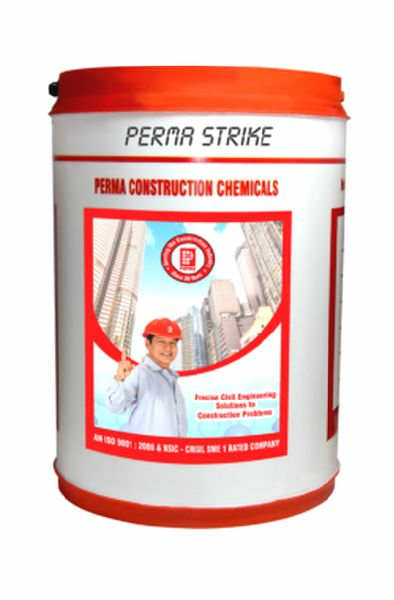 Perma Strike is suitable for all types for all types of cements and all types of cement and all types of shuttering materials or moulds. It is used in multi storied structures with the advantage of enhanced shutter life. It is successfully used in precast yards with minimum effect on the mould and resulting in continued desired finish of the pre-cast element. It is ready to use and no dilution required at the time of application. It can be sprayed for fast application on large areas. It is eco friendly does not release volatiles as it is not based on any hydro-carbon chemistry. Quick and positive release without any damage to concrete or the shuttering / mould material. Protects and extends the life of formwork for repeated use. Safe to use with white cement. Packing : Perma Strike is supplied in 10ltr, 20ltr & 100ltr packing.